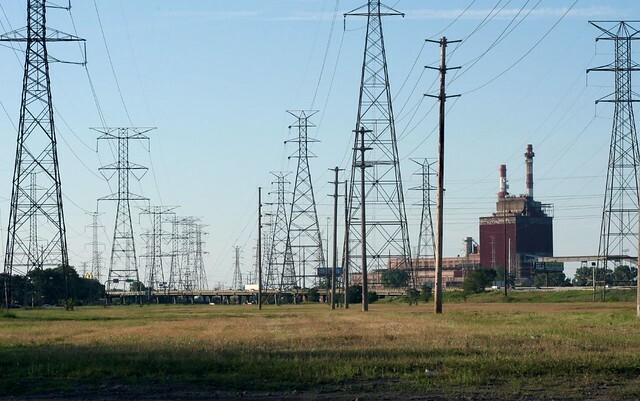 Chicagoland’s biggest power plants – particularly Fisk, Crawford and State Line – are fascinating behemoths. They are madcap assemblages of machinery and ad hoc construction, as tall as a skyscraper, with additions and alterations accumulated over many decades of operation. All three started from a core of massive, pre-Depression, low-rise masonry buildings, embellished with varying degrees of architectural detail; all three exploded upwards as part of LBJ-era expansion programs. 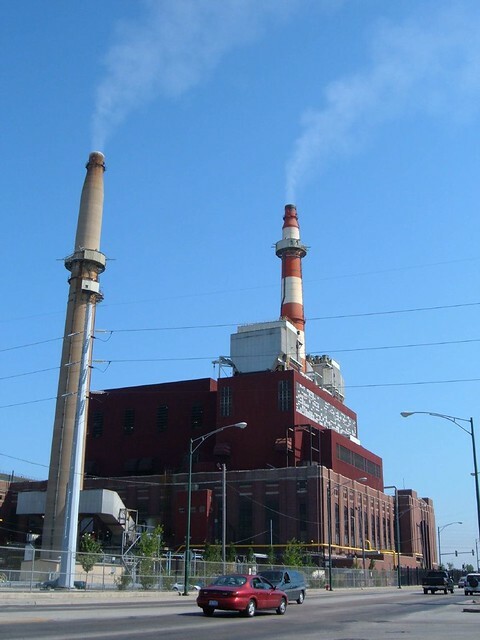 Today, all three are facing closure due to their outdated coal-burning systems, which – despite improved burning techniques and pollution controls – make them the largest point sources of air pollution in and around Chicago. But for me the single uniting factor for them all is something far more mundane – the red-painted metal cladding, with International Style ribbon windows, that distinguishes their Mid-Century additions. 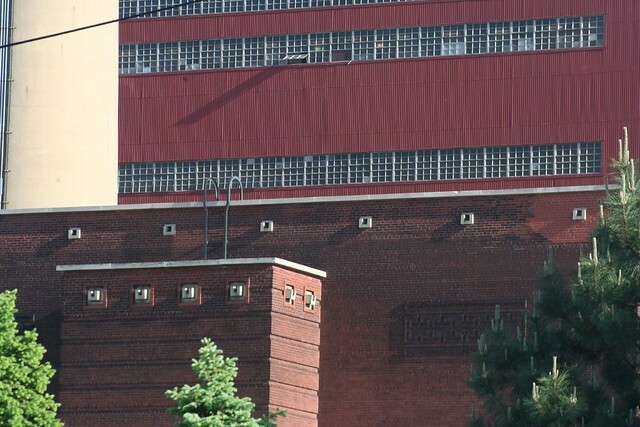 Those additions are mostly built as vertical additions to existing older buildings; they accommodate huge multi-story boilers and burners that used innovative technology to wring more value out of every pound of coal. 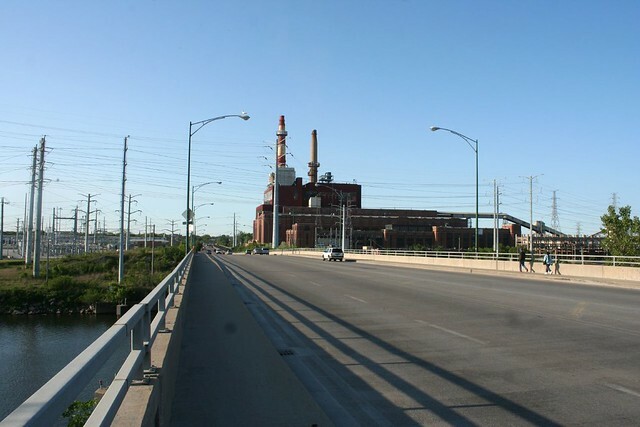 There are other stations of similar styling in Joliet (above) and Waukegan, and even a smaller one by the lake in Winnetka, of all places – but for now we’ll stick with the big three, so prominent to travelers on the Skyway and the Stevenson. 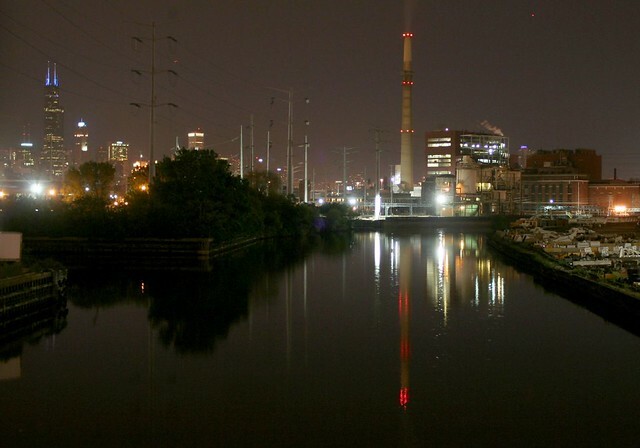 The Fisk power plant is seen by many as the bane of Pilsen. Located between Cermak Road and the Ship & Sanitary Canal, it closely abuts the thriving Mexican-American neighborhood to its north. But for the most part, they are buried under layers of additional buildings, additional machinery, and later remodelings. 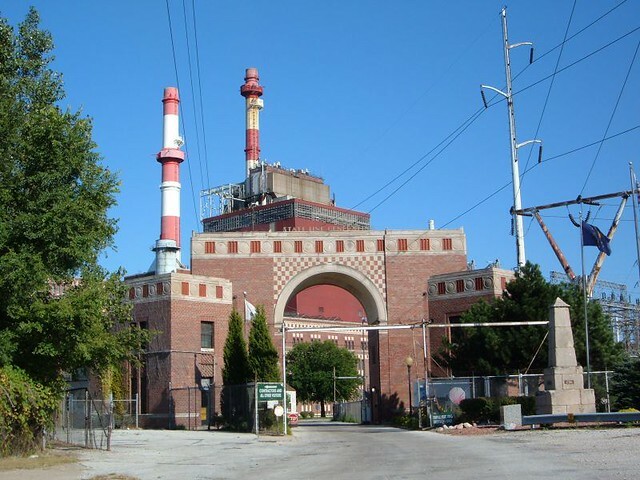 Fisk was built by Commonwealth Edison beginning in 1902. 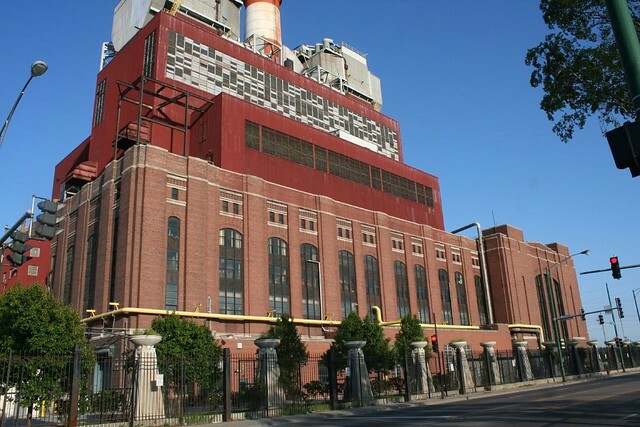 Named for an obscure, now-vanished side street, the new power house was one of the largest in the world at the time, and was expected to cost $6 million. Expected to serve electric-powered railroads as well as homes and businesses, the plant marked the Edison Company’s move to become the area’s premier provider of electricity, under the leadership of celebrated mogul Samuel Insull. It was hailed as a wonder of the world upon its opening a year later, with its 14 massive turbines attracting the attention of visiting engineers. 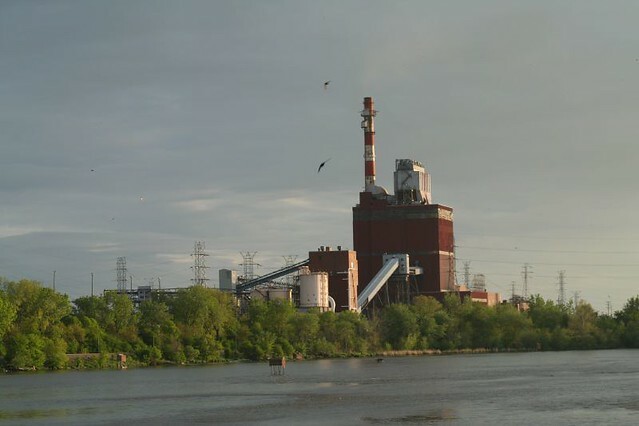 It was also hailed as a boon to the community’s air quality, concentrating energy production in a single location with “smokeless smokestacks”. Coal originally arrived by train; it was mechanically unloaded and fed to the boilers; the ash was automatically removed in similar fashion. The degree of efficiency and automation was a marvel of the age. The massive turbines powered generators featuring nearly-frictionless shafts supported on a bed of high-pressure oil. The original buildings, of red pressed brick, featured a turbine hall of “white enamel brick and white ornamental tile”, with a “floor of imported tiles”, all brightly lit. Over the following decades, Fisk steadily expanded (its original buildings were built with temporary walls allowing further linear expansion.) A major expansion project was undertaken in the late 1930s, including a new switchhouse to govern how the plant’s output was distributed. 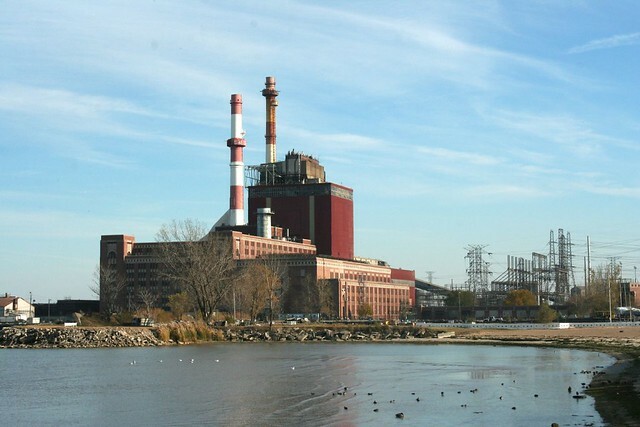 A new turbo-generator was installed in 1950, generating steam at almost twice the temperature of the older units, at a cost of $20 million, along with two 110-foot high boilers; its 150,000 kilowatt output dwarfed the original turbine’s output of 5,000 kW. In 1959, another new turbine surpassed that one, with an output of 305,000 kilowatts, powered by 16-story high boilers. 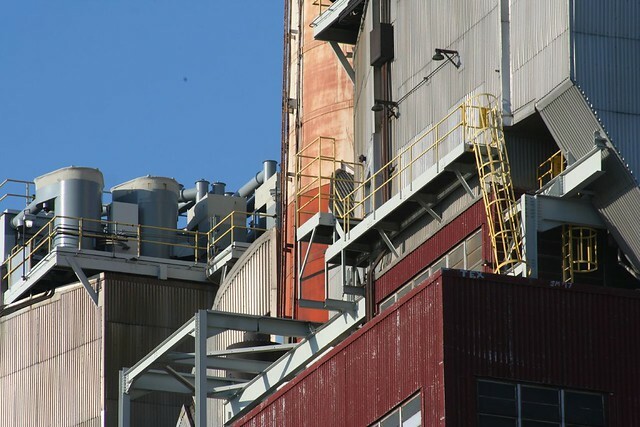 The new boilers included electro-static precipitators, intended to remove 98% of the ash from the boiler output before it ever left the plant. Known as Unit 19, this is essentially the same system operating in the plant today. 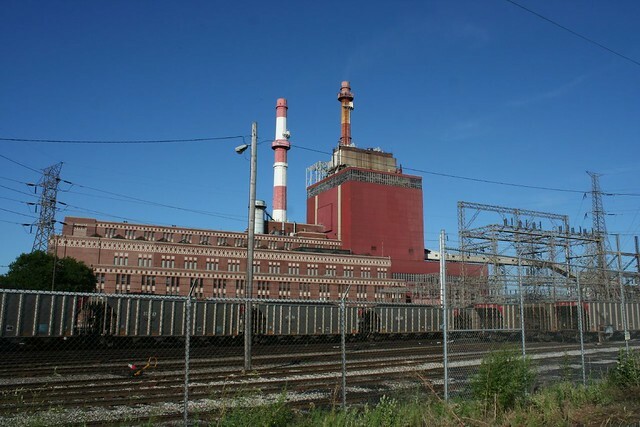 The red-clad portion of the Fisk plant was almost certainly built to accommodate these gargantuan boilers; either 1950 or 1959 would be a plausible match stylistically. Similar projects were underway at the other stations around the area. 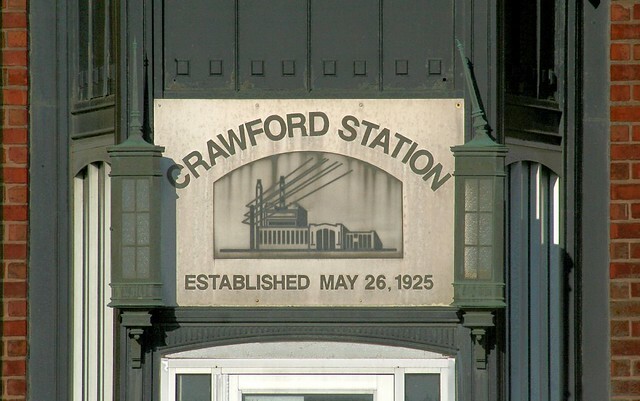 Today, Fisk and its sister Crawford are owned by Midwest Generation, a subsidiary of Edison International. 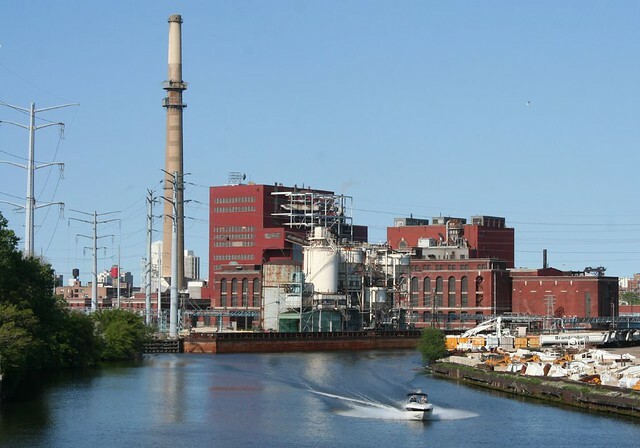 Since the early 2000s, Fisk and its fellow coal-fired plants have come under attack from community activists and environmentalists, with government studies identifying them as major sources of pollution and health risks to the communities around them. 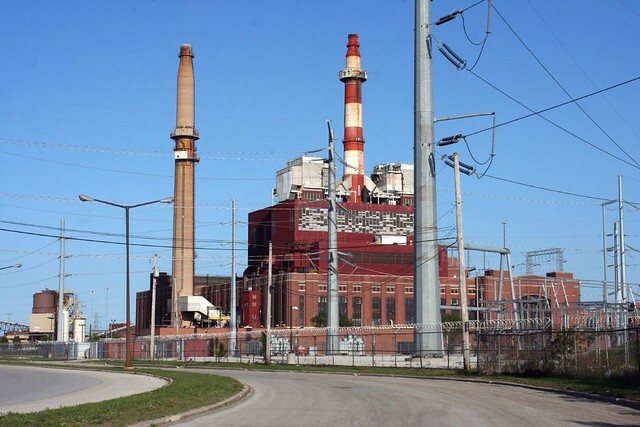 The state of Illinois ruled that the plants must be cleaned up or shut down by 2013; both Fisk and Crawford will suffer the latter fate, with closings planned for the end of this summer. 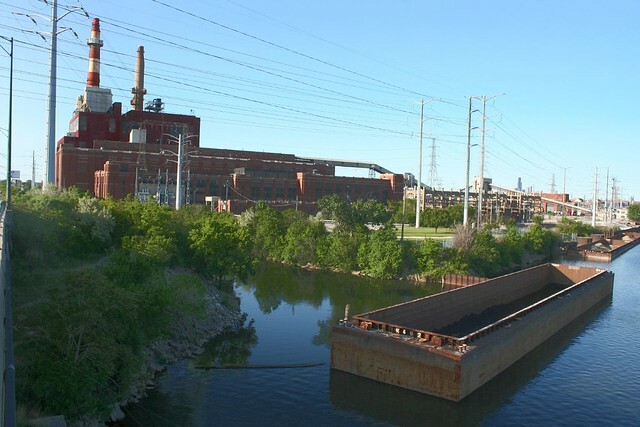 If the sight of Crawford power plant rising up over S. Pulaski Road doesn’t impress you, I can’t fathom what would. 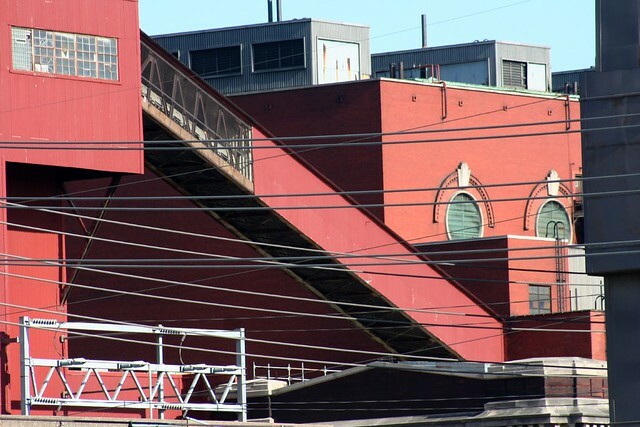 Crawford’s bulk rises some thirteen stories above the street, in an area dominated by single-story construction and low-rise industrial. Like Fisk, it is located along the Ship & Sanitary Canal, giving it an easy source of water and a convenient means of obtaining coal. 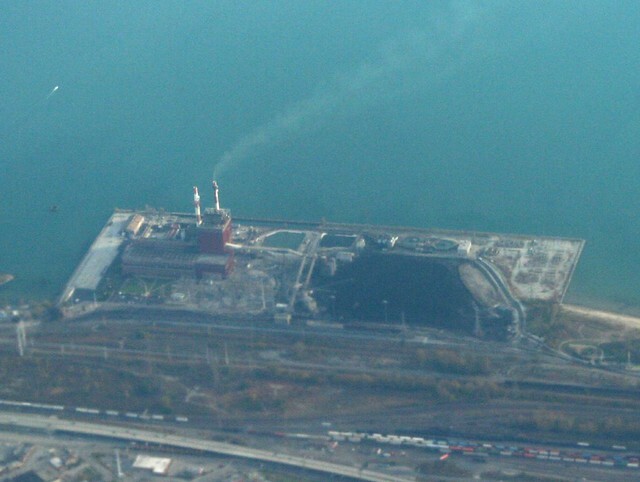 The site has no external rail service; coal arrives entirely by barge, and is carried by a series of conveyors into the plant for burning. 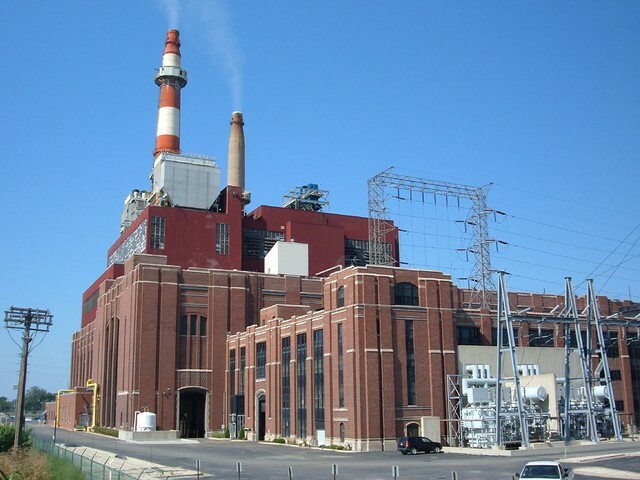 One of the units was replaced in 1958 by a 205,000 kW generator, powered by a 14-story boiler, necessitating the vertical expansion of the plant. The new stories were capped by two massive electrostatic precipitators, still prominently in place today. 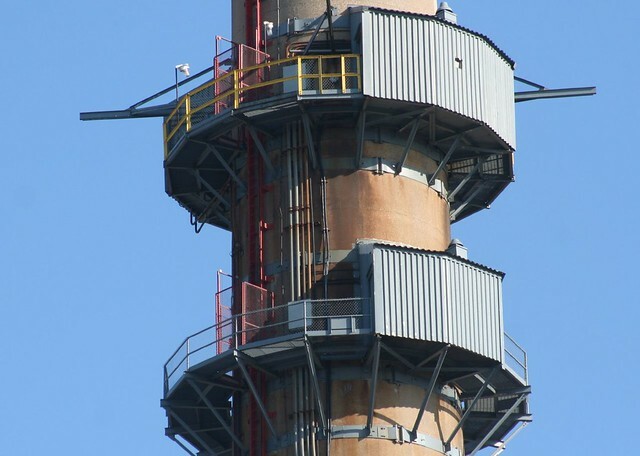 Work began in 1956 and was capped by a 375-foot smokestack. 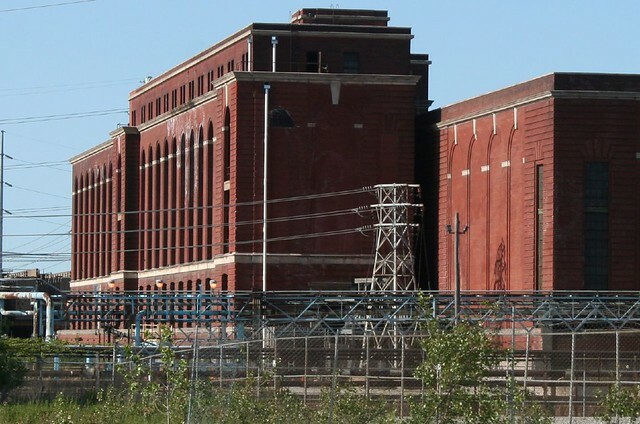 A second expansion began before the first was even finished, with a 305,000 kW generator going into service in 1961 and replacing the last of the older generators. These two generators remain in service today. A 1990 switch house fire at the plant caused a blackout of considerable size, leading to sporadic looting in some poorer parts of the city. 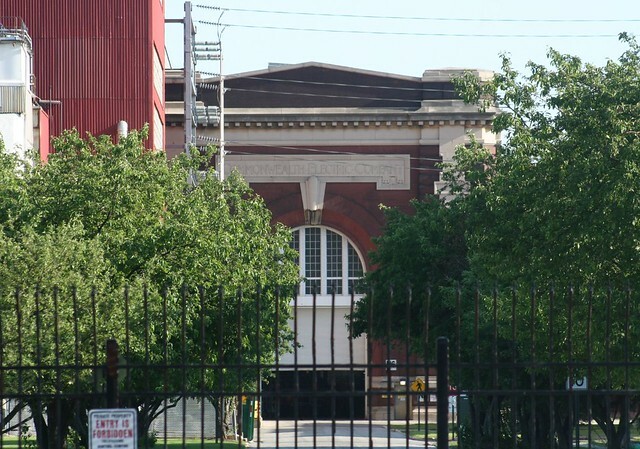 The Crawford power house is viewed by its Little Village neighbors with much the same enmity as Pilsen feels toward the Fisk plant. Its 1960s technology is unquestionably a major point source of air pollution (though in fairness, the nearby Stevenson expressway can’t be much better for air quality.) And like its sister plant, it is scheduled for closure later in 2012 in the face of a State mandate to clean up or clear out. 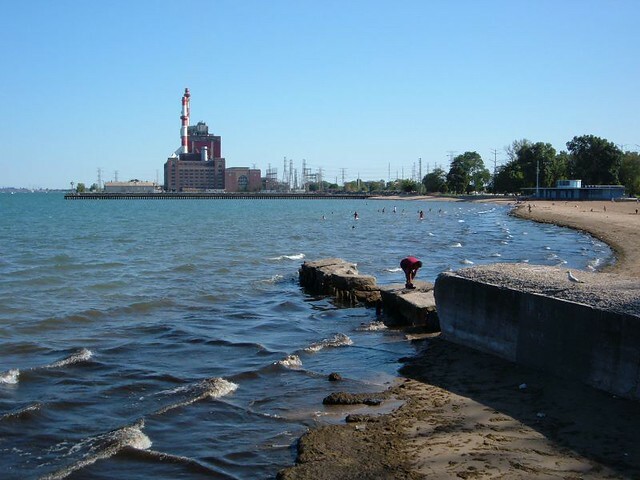 The State Line power plant is named for its peculiar location, just over the Indiana state border in Hammond, Indiana on the shore of Lake Michigan. Initial plans for the plant began around 1921, with the purchase of 15 acres of land – the Eggers estate, owned by a German immigrant since the 1860s – by electric power magnate Samual Insull. Additional dumping and dredging expanded the holding to 90 acres. 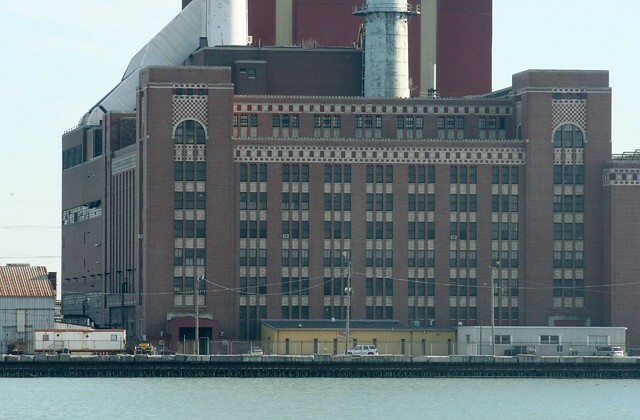 The plant was formally announced in 1926, to be built by its own dedicated company, which would then sell its power to various Insull-related companies such as Commonwealth Edision. State Line Generating Station opened on the very eve of the Great Depression, in September 1929; its three Unit I turbines whose combined output totaled 208,000 kW – surpassing every plant in the country apart from Fisk and Crawford. Its handsome original buildings were designed by architects Graham, Anderson, Probst & White, in a stock brick factory style, sited on artificially created land. 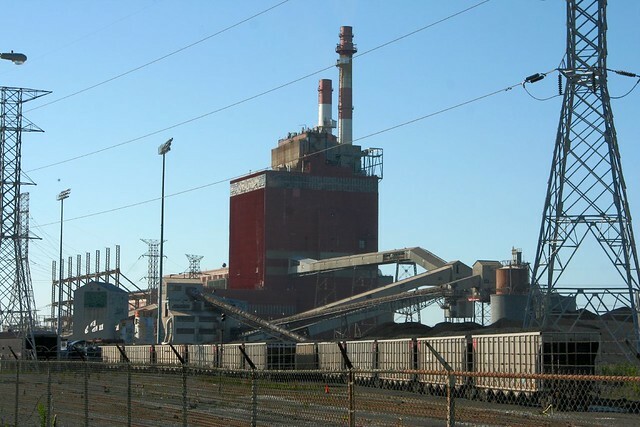 The plant’s coal fuel supply arrives entirely by rail; in the 1960s, a dedicated 100+ car train began running from the Lynnville coal mine in southern Indiana to State Line. The lakeside site is used solely for its access to the large amounts of water needed by the boilers – up to 700 tons of water were needed for each ton of coal that was burned, and plants of this scale could consume a ton of coal every minute. Unit 2 was constructed in 1931. 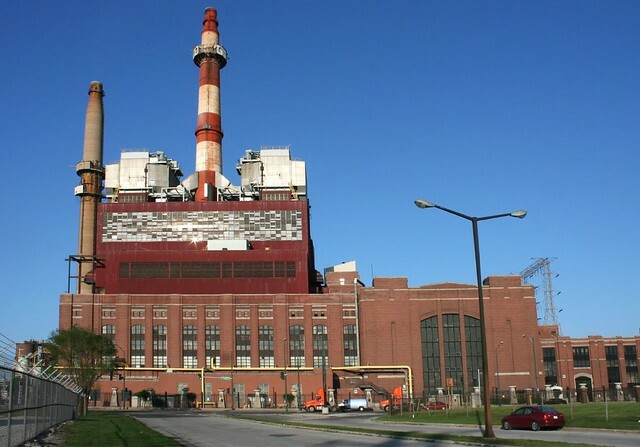 The plant expanded in 1955 (mostly likely when the red-clad Intenational Style highrise portion was added) and again in 1962 with a new 340,000 kW generating unit, bringing the plant’s total capacity up to 900,000 kW. 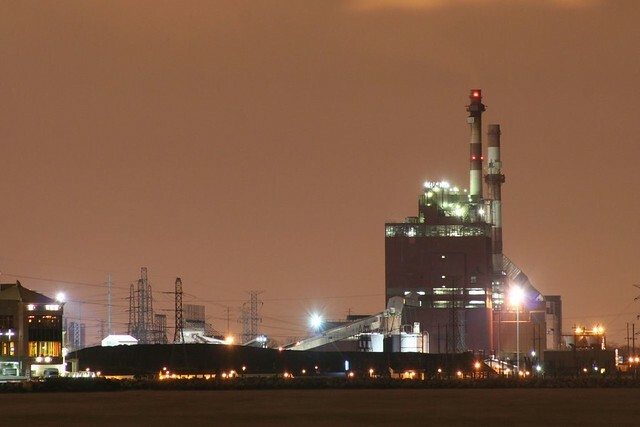 At its peak the plant had 6 massive stacks; only the two newer ones remain today. State Line is famous for a number of things – its odd location and name, its prominent visibility from the Chicago Skyway, its beautiful main gate. It is a designated National Historic Mechanical Engineering Landmark for its original Unit I turbine group, from 1929 until 1954 the largest in the world, and still in service until the late 1970s, when it and Unit 2 were retired. Commonwealth Edision sold State Line in 1997 to Southern Co. of Atlanta; a year later the plant was in the news for a massive explosion in the coal-handling area that injured 17 workers. It later passed to Mirant Corporation, then more recently to Virginia-based Dominion Resources in 2002. 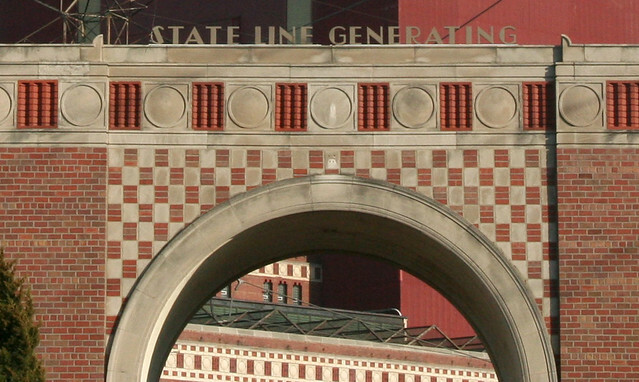 State Line remains the most architecturally significant of the three, with the least amount of alteration to its original buildings. Its 1950s expansion was built alongside the original buildings, rather than on top of them as at Crawford, and it contains the most considered detailing of the three. The move to demolition is both rash and unfortunate – a building this size must surely have other uses in such a heavily industrialized area. Power plants, like large hospitals, tend to acquire layers and layers of complex history, changing and evolving radically to keep pace with time and technology. The result is an aggregate that is is fascinatingly complex – and far more than the sum of its parts. The complexity is the very thing worth preserving. I have yet to see a closed hospital complex be treated in a way that recognizes this fact. St. Louis’s City Hospital was stripped of over half its buildings, leaving the remainder feeling naked and exposed. Even the most generous of the farcical plans for Chicago’s Michael Reese had it stripped down to just two isolated buildings; today the one survivor is a bizarre anomaly, a single link from a vanished chain. If it is so hard to see the preservation value of old hospital buildings – generally built with some eye toward aesthetics – then I fear deeply for these venerable but prosaic complexes. Even if they are not hazardous waste sites – even some unlikely savior sees their massive interior spaces as a potential benefit – it is almost certain that they would be stripped of their layers of history and alteration. 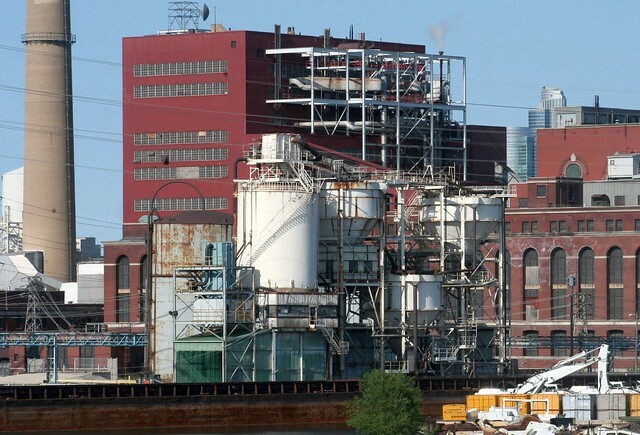 The functional machinery, layered and piled on, will be demolished, leaving only a few selected buildings, returned to a pristine state of faux history. But that is a best case scenario. More likely they will simply be demolished, top to bottom, and Chicago’s once-mighty industrial landscape will be all the more diminished. This entry was posted in Aerial Photography & Views from High Places, industry, Pilsen / Little Village. Bookmark the permalink. There has got to be plans to save the State Line Plant. 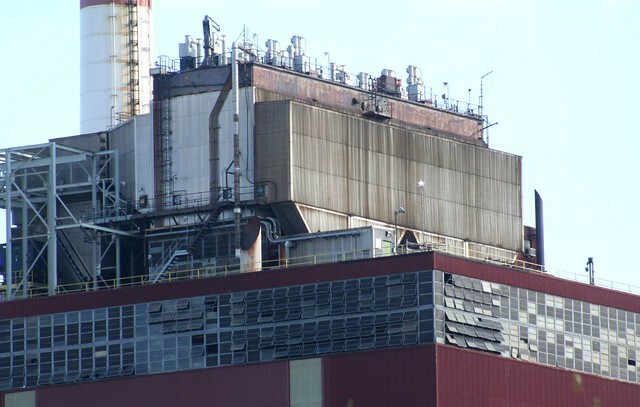 I worked there in the late 90s and knew people who were injured in the fire, which was a result of a short in the conveyor belt control system that had just been installed and was being tested for the first time. This plant, as well as Crawford and Fisk had beautiful turbine floors with ceramic glazed tile walls and floors, with State Line having brass hand rails all the way around with large round spaces that were empty by the time I went there, but were photographed with large brass eagles and other logo design plaques in these areas which were melted down in WWII for ammunition. 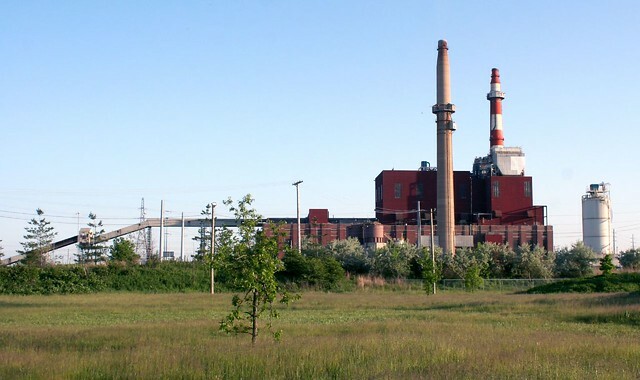 These places were my favorite of all of the power plants in the NIPSCO and ComED system to work in. I live in AZ now and still tell people how beautiful these plants were.